The Lakeview Area Master Plan envisions a walking path beneath the Brown Line from Southport to Paulina. The Low-Line Plaza is a first step. LAKEVIEW — Fans and critics alike of the Low-Line Plaza on Southport will have a chance to help shape the next phase of the project. Organizers of the expansion will host a meeting from 6 p.m. to 8 p.m. March 28 at the Lincoln Belmont Library, 1659 W. Melrose St., to gather community input. The plaza opened in July under the Southport Brown Line "L" station. The Lakeview Chamber of Commerce, which began running a summer farmers market under the station five years ago, added planters, seating, pea gravel and a walkway of brick pavers to what was formerly a gravel parking lot. 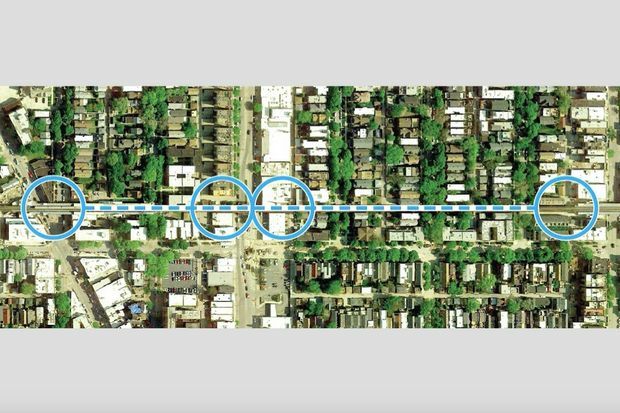 In keeping with its 2011 Lakeview Area Master Plan, the chamber wants to extend the walkway to connect Southport Avenue and Paulina Street, running under the "L" tracks between the two streets. "We think we can make a large impact with a series of small improvements," said Dillon Goodson, the chamber's community development manager. "But the community engagement is important before we have any designs in place." Those who can't attend the March 28 meeting will be able to submit feedback online. 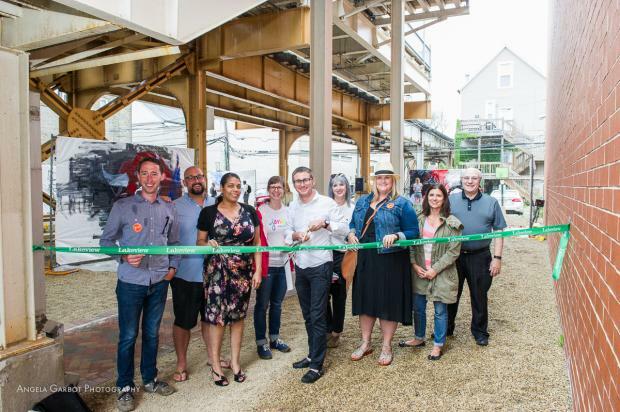 Surveyed residents on Lakeview's west side said they wanted to see stronger connections between subdistricts of the chamber's coverage area, which roughly spans from Waveland to Diversey and Ravenswood to Southport. 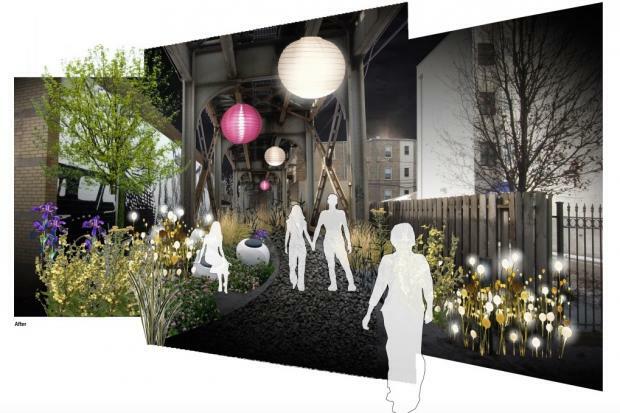 The green walking path would have solar-powered lights and garden elements, with the hope of attracting more visitors to the area — particularly along Lincoln Avenue, which struggles to compete with the bustling Southport Corridor. Construction would begin in 2018. The Low-Line project would be permanent, unlike the temporary and controversially polka-dotted Lincoln Hub. It would also offer a potential expansion of the popular Low-Line Market, which kicks off its fifth summer June 1. 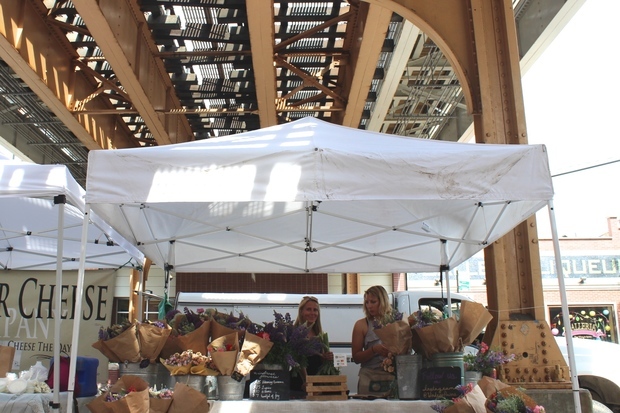 "Fortunately, the farmers market is doing very well," Goodson said. "So the idea of activating the space underneath the train maybe doesn't seem as unusual as it did five years ago." The chamber has enlisted PORT Urbanism consultants to design the project. The urban planning firm previously has worked on Chicago projects like the vision for Goose Island 2025 and a 2015 proposal for the lakefront. The $22,600 for building the plaza came from the chamber's Special Service Area, which levies an extra property tax to pay for improvements meant to encourage development in business corridors. Goodson said PORT Urbanism estimates designing the expansion will cost about $36,000, although a budget won't be finalized until designs are approved. Last year, the chamber spent $86,115 of the $723,642 Special Service area budget on sustainability and public places, according to its annual report. Another $246,963 was spent on public way aesthetics like planting trees, garbage pickup and holiday decorations. Other major budget categories included $160,798 for customer attraction and $139,680 for personnel. The chamber itself spent $255,443 on programs and services, $90,821 on administrative costs and $25,526 on fundraising. Its budget is derived from member dues, events, marketing and contracts.